Owning a car is a convenience that many families have come to rely on. It makes getting to and from work a breeze, getting the kids off to school and various activities, and just your regular errands so much easier. You have the freedom to come and go as you like without having to worry about public transportation schedules or expensive taxi services. However, while owning a car is something that you may consider a necessity in your own life, unfortunately, they don’t last forever. What this means is that you will reach a point where that car needs to be replaced. If 2019 is the year a new car is in order for your family, then there is no doubt you are already feeling a bit of stress and pressure. A new car can be a rather expensive purchase, plus there are a lot of factors to consider when picking that “perfect model”. Here, we’ll take a look at how you can take the stress out of buying a new car so that your head is clear, and you make the best purchase for your list of needs and wants. A great place to start is with setting a budget. Ideally, you want to do this before you start the shopping experience so that you aren’t swayed by the shiny models sitting in the showroom. When settling on a budget, break it down into what the payment would be so that you understand how it would fit in with your monthly bills. If you don’t already have a household budget created, this is a great time to do so, as it will help you to determine what kind of car payment is feasible. If you plan on getting rid of your existing vehicle, then you may want to look into the Scrap Car Network that offers money and free pick-up of your car. The way it works is that you can visit the website, key in some basic details about your vehicle, and then you’ll be given an instant quote/offer on what Scrap Car Network would pay for your vehicle. If you’re happy with the offer, you can accept it, and they arrange for free pick up of your car. This is just a small list of the items you may consider essentials. There may need to be some sacrifices on your part, but at least if you have a list with you, it can act as a rough guideline. While a car may appear perfect on paper and when you’re looking at it online, it’s not until you go for a test drive can you make an educated conclusion. It could be that the car you figured would be your “dream car” doesn’t handle as you imagined and isn’t what you’re looking for. You always want to think you’ve made a wise and sound decision when it comes to a big-ticket purchase, and research can help reassure you that this is the case. Once you have narrowed down your list of models you are interested in, spend a little time doing your own consumer research. This means reading consumer reports and reviews from other drivers. You may discover things you weren’t even aware of such as the safety rating of a vehicle that could drastically alter your opinion of the car. It’s a good idea to start doing the research the moment you start thinking about buying a new car. This research can be rather time-consuming, so you don’t want to leave it until the last minute. 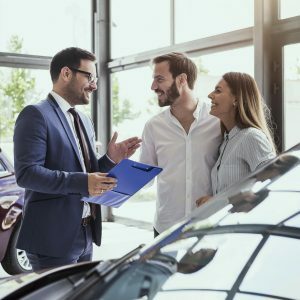 While it is certainly wise to be cautious about making a big-ticket purchase, and take your time doing so, buying a new car doesn’t have to be an extremely stressful event in your life. With these tips, you’ll be able to strip away all that stress and get down to the details, so you can make an informed purchase decision.